Does surfing seem daunting to you? 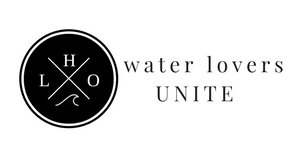 Try Stand Up Paddle Boarding - the exhilarating water sport sweeping the country. The origins of SUP can be traced to Hawaii in the 1950s and 60s when beach boys used long paddles to sweep their boards into the surf and capture photos of wealthy tourists. In order to keep their cameras safe, the paddlers had to balance on their boards with confidence. Over the years, the activity evolved and is now a fast growing outdoor fitness craze. In its current form, SUP involves standing erect while using a paddle to move forward on a large board that closely resembles a surfboard. 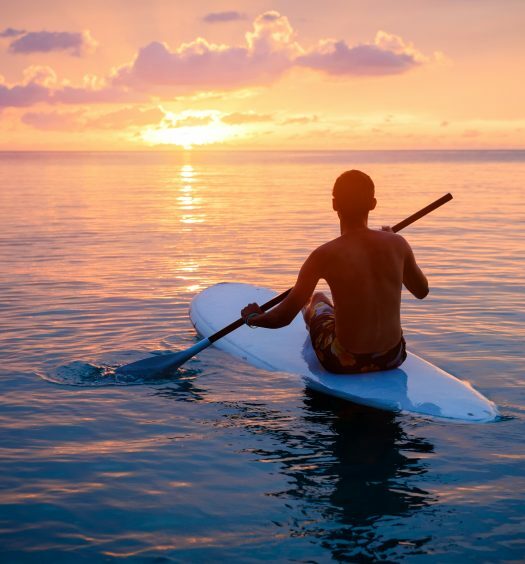 As a fitness option, stand up paddling has many benefits. To begin with, it’s a low impact sport that doesn’t overstress worn joints. 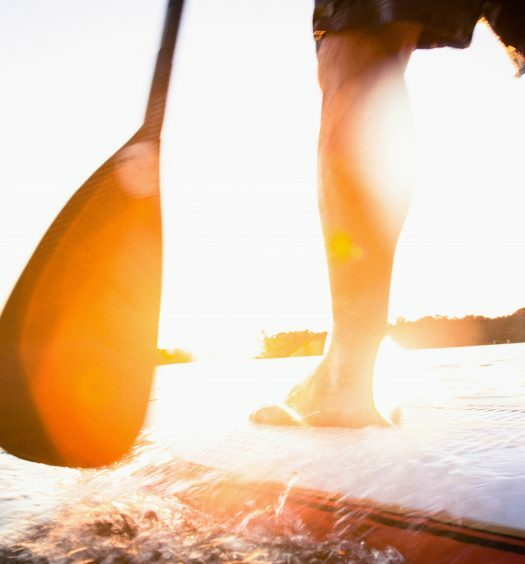 In addition, because standing on a SUP board requires basic balancing abilities, it’s an activity that builds core strength and enhances overall health and fitness. Since it works both the lower and upper body, stand up paddling can provide a participant with a total body workout. Finally, when participants pick up their paddling speed, SUP can offer a heart healthy aerobic workout as well. 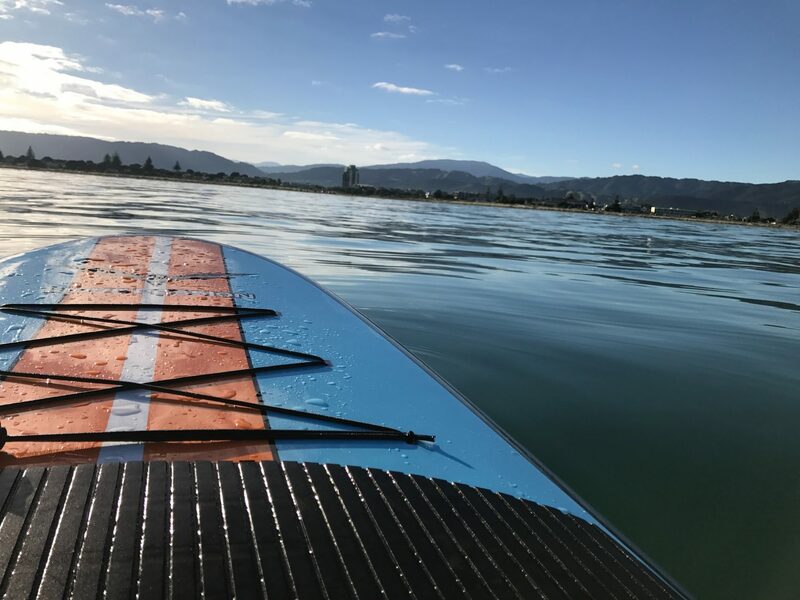 Unlike surfing, which needs to be done on the waves in the ocean, a SUP participant can use almost any body of water including bays, lakes, rivers and ponds. This versatility has allowed the sport to expand beyond its inland origins and reach a greater audience. That’s why you’re just as likely to see a SUP board in Boise, Idaho as in Miami, Florida. Getting started with SUP requires two pieces of equipment: a board and an sup paddle. Though it may look like a surfboard, a SUP board is wider and designed for greater stability. While a typical surfboard is approximately 20 inches wide, a SUP board is generally 32 inches wide. They’re also a bit thicker than the average surfboard. Wider boards, which provide greater stability, are recommended for beginners. A wider board also works best on flat water like lakes and bays. Narrower boards are also available for the more experienced participant. Though less stable, a narrow board is more maneuverable and often better for catching a wave on the coast. Ranging in cost from $400 to $1500, a stand up paddle board can be purchased in surf shops and outdoor outfitters throughout the world. The SUP paddle resembles a kayak paddle but has a much longer shaft. Typically a SUP paddle should be five to six inches longer than the participant’s height. We have compile and reviewed the top SUPs for big guys. A novice stand up paddler will want to start out in calm water and practice gaining balance and confidence. After that, the participant will focus on proper stroke and the basics of maneuvering before moving into the surf. Much like a canoe, a SUP board turns to the right when the paddle is stroked on the left side of the board. It turns to the left when paddled on the right. Stand up paddling isn’t just for beach boys anymore. Today’s craze offers a healthy and fun activity for participants from a wide range of fitness levels. All it takes is a little balance, some concentration, and love for being on the water.